I am a turnupstuffer from way back. What is a turnupstuffer you ask? As in the books of Pipi Longstocking by Astrid Lindgren read to me in my childhood, I still enjoy a bit of dragging home stuff that turns up. This happens more often since we moved into a postcode where the local council collects larger items of household refuse every two weeks. I planned a run one morning after school drop-off and then it started raining - I got peeved and went anyway.Which was great- I felt oh-so righteous, and then I met this chair.. Someone actually put out this amazing chair on the curb, for council clean-up on the Monday morning, and it was really unique not to mention wet and a bit sad looking. I thought, with the seat curve the reflecting those of our 1950's club chairs, and the wicker and square back working with our boxy modular sofa and our wicker toy-box, it might just tie in all our pieces. With a clean- up, dry out I thought it would be a synch to recover in suede. Anyway, Mr Frenchie was horrified so I gave him the stink-eye to show him I meant business. Anyway, I thought it may still go out on the curb, for Monday or I might donate it to my friend @SewPaintIt who restores furniture for light entertainment. You could easily see how it screwed together and it looked like a synch, but the BLOODY SCREWS WOULD NOT COME OUT! In the end I took it over and she and SewPaintIt hubby got my screws out for me, and gave it back to me, God love 'em. Enthusiastically I pulled the chair to bits, coated the cane back in Reviva acid wash to remove the tannin tinge and followed that with a coat of new stain to freshen it up. So the back was leaned up against the living room bay window and the base was sent upstairs to be tripped over and cursed for a month or so. "It's the back of a chair." "It doesn't look much like a chair.."
I broke every one of my nails but the deed is done! The difference in pictures is subtle, but I can assure you it rocks in charcoal (faux) suede and the cane has lost it's greenish tinge. I may still have to invite the SewPaintIts to dinner and subtly suggest they bring their power tools because I CANNOT GET THE BLOODY SCREWS TO GO IN all the way. Now if you are interested in this Turnupstuffing caper there is further fun and information on: The Museum of Turnupstuffing: celebrating found art treasures. AND if you want more inspiration than I've provided here (wouldn't be hard) try Funky Junk Interiors and be blown away. PS: I also found this little beauty on the roadside, with a broken suitcase jammed unceremoniously into it. Hey SewPaintIt lady, it's Council Clear-up Monday, do you want to swing over this way and do a drive around with me tomorrow? Way to persevere! 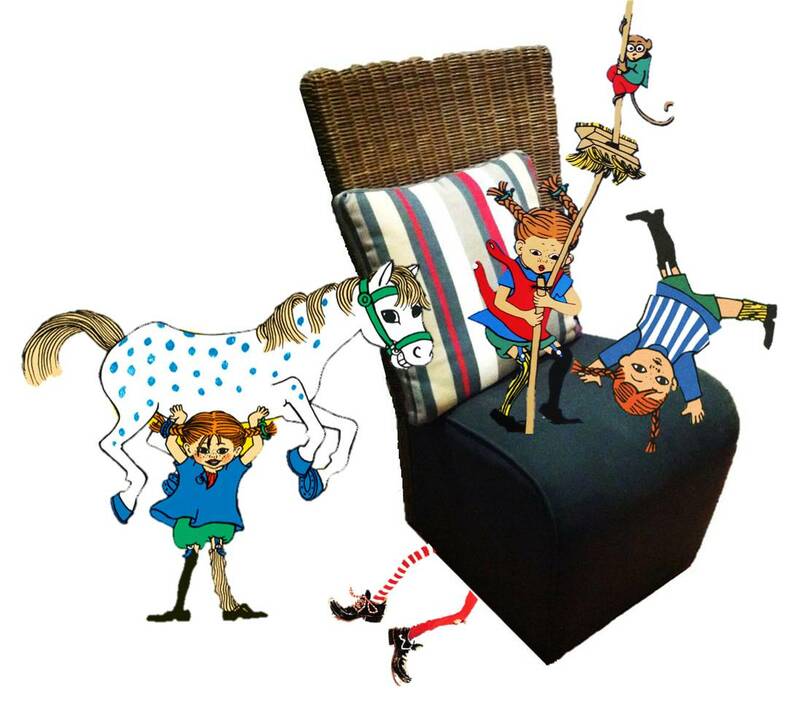 Love your Pippi Longstocking reference! She's one of my favorite! I think I was here for Halloween twice. None of my class mates at my predominantly low income school knew who I was. Thanks! And hey, I would love to see your costume! Did you blog it? Would ypu post the link. I make a lot of costumes for Our little pink worshipper & sometimes they almost turn out the way I want. I love that it looks the same after. That is my favourite part. Screwing the screws back in is a lot more expensive. We can come tomorrow if it is council clear up then. visiting you from finish it up friday. This is awesome.